Earlier this summer, I vowed that I would go on a six-month plant buying hiatus, starting the day after my birthday, July 16. According to the tag this is Iresine herbstii 'Aureo Lime Green,' which I suppose is a variation of Iresine herbstii aureo-reticulata. Sold by a local nursery as an "annual" for containers, these make decent houseplants with lots of light and regular watering. Closer view. I love the contrast between the variegated leaves and the shocking pink stems. A replacement for the Hedera helix 'Goldheart' I lost to spider mites last winter. This was actually the plant that broke the hiatus, about two weeks ago. I tried to convince myself that replacing a plant didn't really count as buying something new. 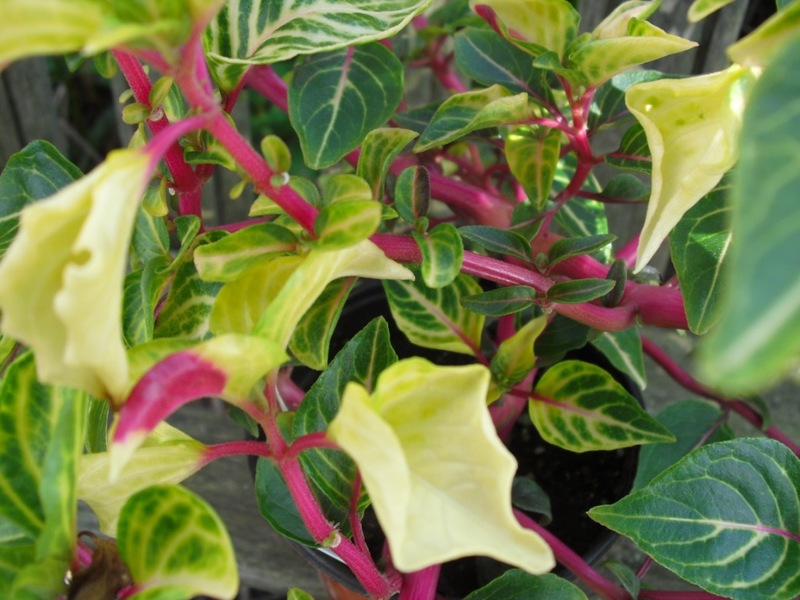 The following plants aren't naughty, since I purchased them before the original cut-off date. I just hadn't gotten around to showing them off until now. According to its tag, this is Aloe 'Fire Ranch' If you click for the larger view, you can see the nice red teeth, though I think the name is actually for its red and orange flowers. Aloe 'Wamsley's Bronze' variegated, according to the seller. 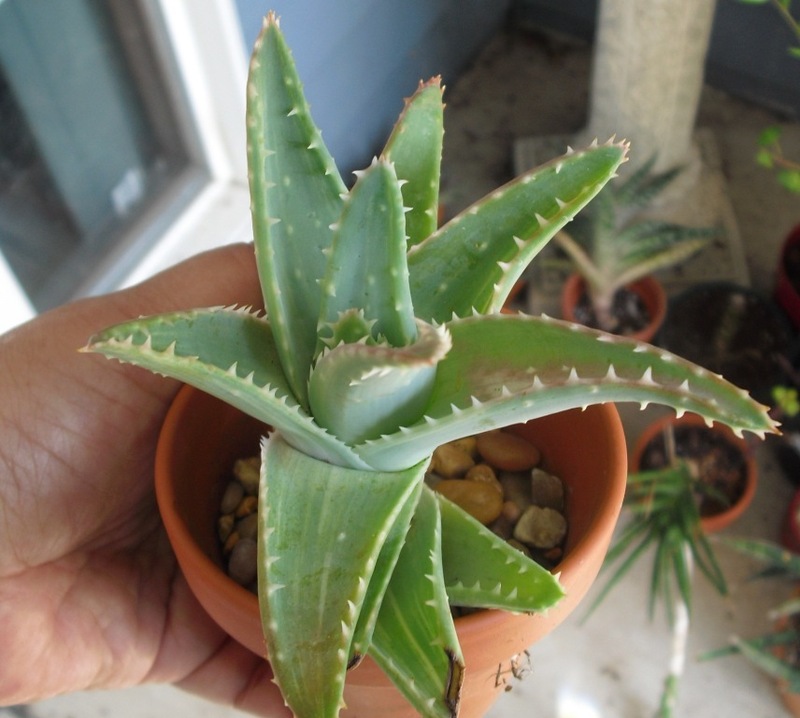 This aloe, an eBay auction win, arrived with its rootball almost completely severed from the stem, due to a less-than-stellar packing job by the seller. I told him I wasn't going to ask for a refund immediately, since I thought I could reroot it, and he said to let him know if that didn't work out. (I still think he should have offered a refund regardless of the outcome, but c'est la vie.) It did root, surprisingly quickly, and is even putting out a new pup. I also won the Huernia below from the same seller, and it arrived undamaged in the same package. Aloe brevifolia. 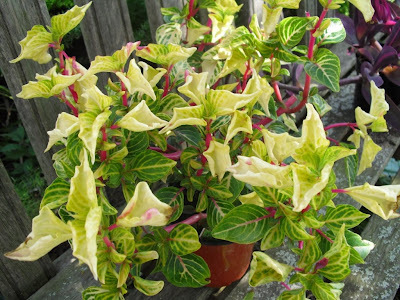 There are faint lines of variegation in some of the leaves. 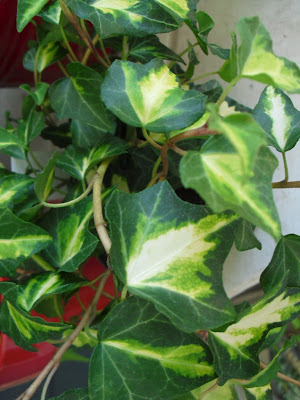 One leaf had a bigger area of variegation, which seems to have gotten lightly sunburned. I've decided to abandon the idea of a buying hiatus for now, because being naughty has, quite frankly, been quite nice. Oh, hehehe...I wondered how successful you might be with that plan!!! LOL! Hey, I'm with you...when I want a plant, I want a plant...and must have it! Hee. You sure got a lot of very pretty aloes. I love the one with the red teeth!!! Also love your new huernia...LOVE, LOVE, LOVE!!!!!! Good finds and great buys!!! Have fun with all your babies! Very interesting selections. Good luck with the hiatus. LOL. 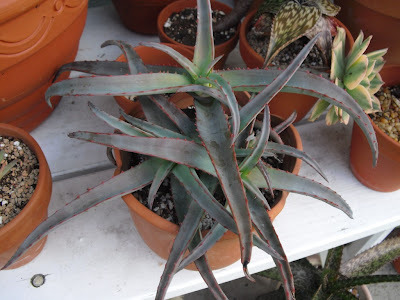 Aloe 'Fire Ranch' is very interesting. 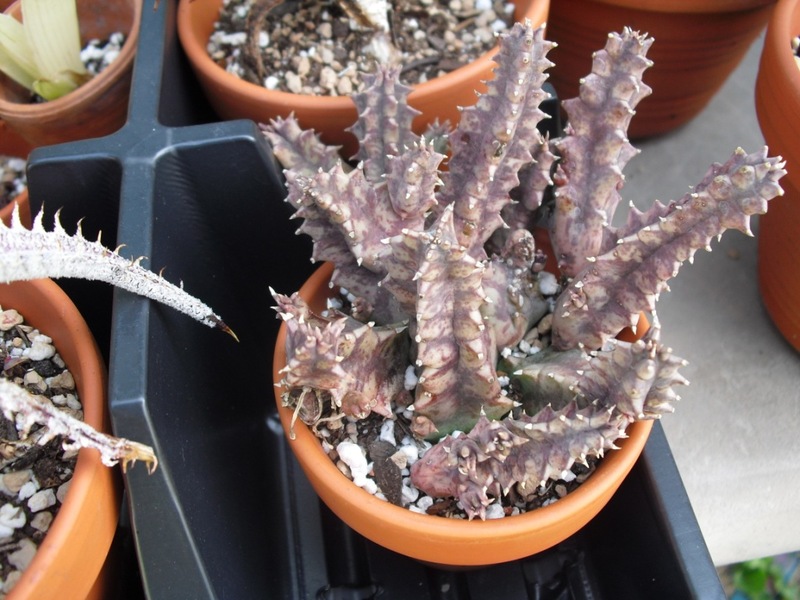 Wouldn't stay colored-up very long for me, probably (none of my Aloes ever have), but it's interesting. The 'Walmsley's Bronze' looks a lot like a NOID plant I bought a while back, except that my plant was dark brown. Basically Alworthia 'Black Gem,' except variegated. The Iresine is really pretty, though my experiences with 'Blazin' Rose' are such that I don't expect to try Iresine indoors again. 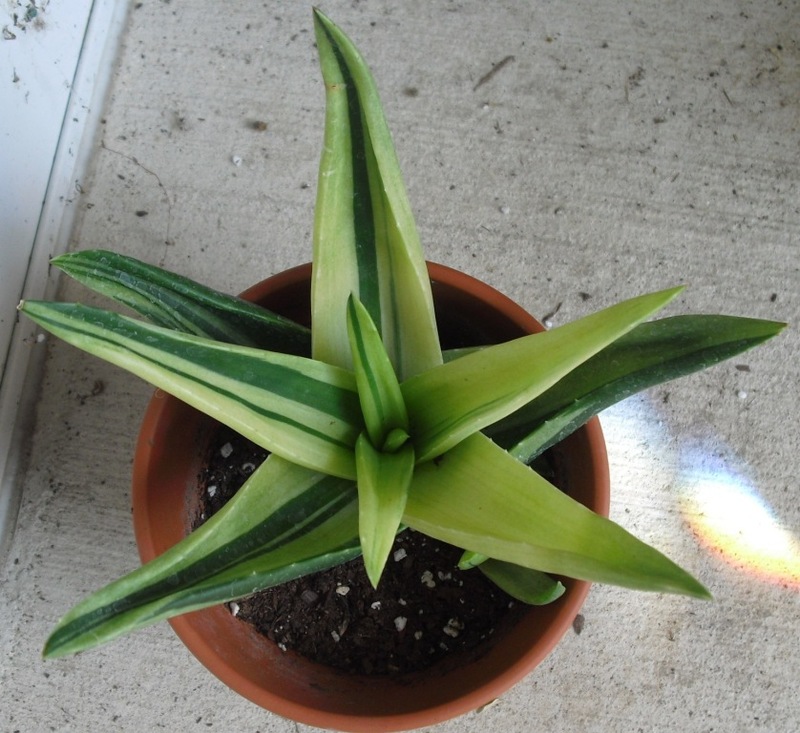 Too big, needs too much light, fills the pot too quickly and then is impossible to keep watered, etc. The only kind of Plant Lady that's Fun is a Naughty One. 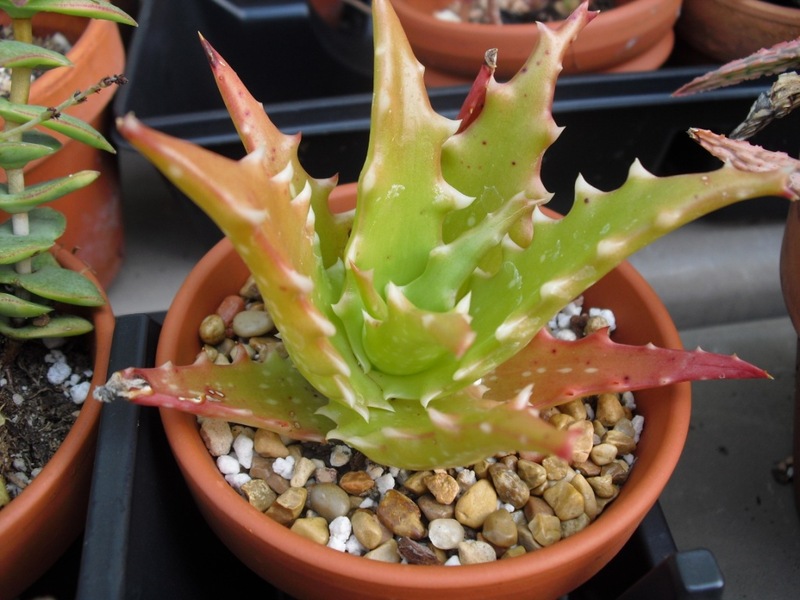 Those trove of Aloes is the score - you should, like the rest of them that you already have, grow them quite well! I wish I had known you didn't have A. brevifolia (grows like a door mat in San Diego), as I would have sent you one in days gone by. Still, and with those other plants, you did break your pledge, nicht wahr? I don't even try that - not with a set end date. No way I'd reach it. 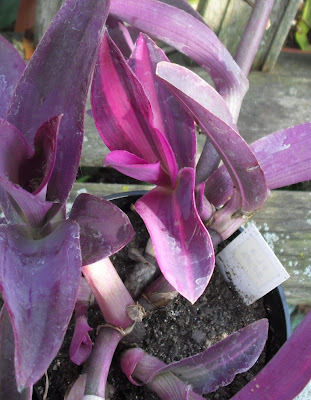 Which reminds me, I really need to post about my new plants.